To be honest, this whole time away from home, travelling across the far north-east end of Asia, the thought to returning never occurred to me. Not even the festive time of year could melt my cold Christmas scrooge heart. Last year was spent in a bunk-bed in Alice Springs, Australia with the flu. I didn’t anticipate this to be any more luxurious. Luckily, living in a country which doesn’t celebrate it makes the month of December bearable. However, in a broader sense, Christmas is about family, a time to come together. My father shared this sentiment, and believed my blessed mother would appreciate it even more. Following a few discussions, the decision was made that I’d travel home for Christmas. Over the course of a few weeks we discussed potential plans, the quite complex logistics of getting back. Despite having a packed teaching schedule, there was a window open in early December. Therefore, the plan quickly became a “coming home for Christmas”. BUT here’s the kicker, it was a secret. Outside of my father and my siblings, nobody else would know; included my mother, grandmother and young nephews. So I now had the incredibly fun and accelerating task of planning a route home, a travellers pleasure. 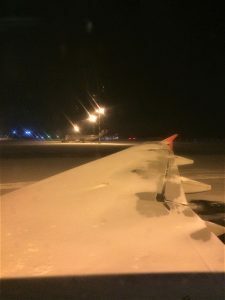 Being an authentic cheap-skate traveller, a direct flight from Beijing to the UK was much too expensive and much too easy. I couldn’t understand travelling all that way without seeing something along the way. It was important to remember that time was a factor. I had a total of 10 days to play with. In that time I’d have to get to Wales and back in time for my classes. In that time i managed to include a few treats. I landed in a quite obviously Russian airport with proportionally higher level of blondes and stereotypical Russian hats surrounding the area. After 2 hours sat observing casual Russian life, I caught my connecting to Czech Republic’s capital landing at 11am. From here, neither my body or mind could handle a third successive flight. Back in the planning stages, Prague looked like the perfect place to stretch my legs and have a quick look around town. My next transport wasn’t until 10:30pm that night, so I had the entire day to explore Prague. More than enough time to tick everything off the must-do list. Although Prague internationally has a reputation as the stag capital of the world, I can’t work out why. Of course, there are some obvious signs: cheap beer, intensely attractive women and novelty “cannabis-infused” snacks too weak to make a toddler giggle. Despite this, its truly a beautiful city soaked with incredible history and culture hidden amongst the medieval cobbled streets. After catching a bus and a subway, I was dropped in the heart of Prague with no time to loose. 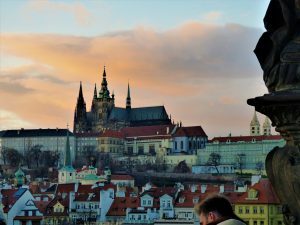 Prague also coincidentally seems to be the perfect city for travellers on a tight schedule. Practically everything worth seeing lines-up along a near perfect straight line through the city. Luckily enough I’d be catching my next form of transport on the opposite side of the city. 12 hours or so was more than enough time to see all the sites without the need to rush. 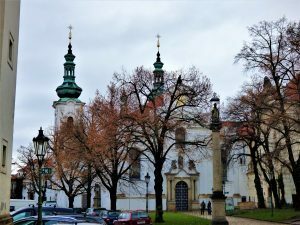 Starting from the Western-edge of the city with the picturesque Strahov Museum that provides a perfect panoramic view of the city. From here I began wondering Eastwards, spending time marvelling through the little-mentioned Alchemist Museum (one of my personal favourites). 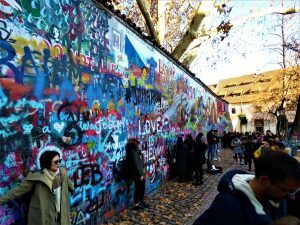 Moving towards the centre of the city you’ll also pass a cultural icon; the John Lennon Wall, along with its attached hordes of instagram post seeking tourists. Around the corner is much the highlight of Prague, an image synonymous with the city; the Charles Bridge. None too often will a bridge provide such a vast opportunity to marvel and observe both the curiosities found on it and which surrounds it. Either side of the bridge provides spectacular example of stunning historical architecture, as well as the countless blackened statues dedicated to the greats of the past. Some of which having been worn smooth by countless visitors wishful touch in the hope of luck. On the other side of the Vltava river, you’ll find an equally famous site synonymous with Prague, somewhere that will have a patient crowd gathered around it every hour; the Astronomical clock. Next to which you’ll also find the immaculate Old square. Being the time of year, this was also the site of one of the best Christmas markets I’ve been fortunate enough to witness. You find the usual repeated stalls of seasonal themed snacks and the pungent odour of mulled wine in the air. The moment was made even more authentic with a children’s choir belting out Christmas classics, including a very nostalgic “Home Alone” soundtrack. To be fair, two (quite significant) sites had to be missed. The first of which was my very first site, Prague Castle. The site was one of those that required a search of your bags. Being as I was travelling home directly from the airport, I had all my luggage on hand. The security guard was absolutely mystified when she pulled out one of my nephew’s Christmas gifts; a pair of foam nun-chucks. I’m willing to bet that was a first for her. With a truly sympathetic face she said she couldn’t let me through with them, so I was turned away as she repeatedly said “Sorry“. The other was the highly anticipated KGB Museum, something found on every Prague “must-do” list. However after seeing that the incredibly small museum had allocated times for tours only at quite a considerable price, I passed. “no” well thanks for the help. Luckily, there was a tourist centre directly next to the bus station. Running in a clear state of panic and with my finest puppy dog eyes I begged for use of his printer which he so very generously agreed to. The second speed-bump occurred during the border crossing into Germany. Europe is known for its pretty lax border crossings. For many there isn’t even any indication that you’ve entered another country other than a sign. However I was made fully aware here. Perhaps due to recent troubles throughout Europe and/or the enormous influx of refugees into Germany, their crossings appeared incredibly stringent and almost militant. I was awoken to the loud cries of “PASSPORT, PASSPORT!” as everyone curled open from their slumber with strained eyes. The immigration officials checked everyone’s documents dutifully, paying particular close attention to me. They asked a number of questions “where are you travelling from? How many bags do you have with you?” which they very stringently searched. Countless numbers of airport security and bag searches I’ve been through, but none were nowhere near as detailed as this. Absolutely EVERYTHING within my possession had to be removed and closely inspected. The officers also kept an incredibly close-eye on my hands as they rummaged through my pockets. An intensely cold sweat ran down my spine as the officers discovered a Thai cigar seemingly stashed in an external hard drive case. Thankfully they were satisfied with a smell test that it wasn’t any contraband. In the end they were satisfied and let me enter their country. So, what was this all about? Why was I singled out? Well a Mexican individual on the same bus also got the same stringent search. Coincidentally, I later saw the very same guy…on our bus on the way to Amsterdam. Ahhh so that’s why we got searched. From here on I entered my 5th country in total, and my 4th unclaimed ground, Belgium.